Ai is kwikk, tuu! Congrats awn ur tye, anni adn gamma! Thx AP – sowwee fur teh dilai in riplyin – been awn teh fone wiv Puddy. Ai duz dis wen ai nawt gettin whut ai wants, wen ai wants it. So dat meenz papaz bin rezistin mai demands lawng enuff for meh tu fawling asleep. Mebbe ten or fiffeen sekkundz, at leest! Well, dats better than Cannoli, who stands next to my leg and says ‘MREEEHHHH” when he wants something. Ai izza ekwal oppurtooniteh grabbur … if u manijez tu gettin dat kloase, konsidur urseff a valid targit! Conga-bellehs anni and gamma awn yr swiftee pawz. heers teh burfday fairy to say HAPPEE BURFDAY to Sacredflesh, Scarletkitty an evreewun else hoo haz a burfday today! i haz bringd yummy fudjy burfday caeks, fluffy marshmellow caeks, iskreem, fizzy frooty party punch, fansee shiny party hats, an goodie bags filled wif protectib gluvs an snorgl snorkles for saef belleh snorgling, cartoon character bandijes for thoze skratches yoo will get anyway!, kandee, an fuzzy kitteh stikkers wif googly eyes (an no poynty endz)! an a big swish ob teh burfday wand to making all yor burfday wishes come troo! hippo-birdai to all the birfdai peeps! On hoose noze wud taht be nao, ms gamma? Owwww… Da stikker stukkid mee!! It has a sharpee! Isle try teh marshmello cake insted !! kitteh iz wayting to handcuff hooman to can opener…..
Fankees EM! It’s a long wai frew teh floof! 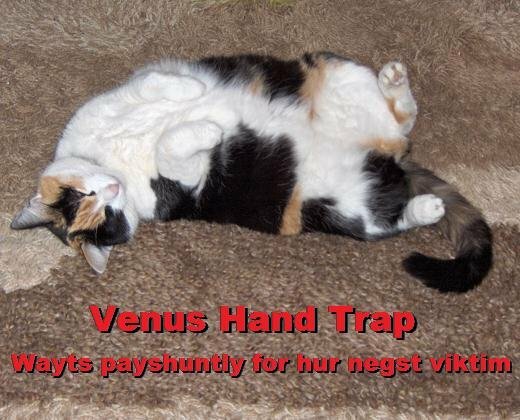 At hour haus, tihs am called “Teh Belleh Trap”. Luks sew cyut, until yur hand is grappled and bunneh-kicked into submishion!